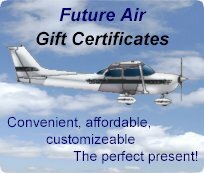 Future Air offers a wide variety of gift certificates for those who want to buy a Future Air experience for a friend, loved one or yourself. Prices for sightseeing gift certificates are as listed here, and we also offer a Discovery Flight flying lesson certificate for $129 +HST. Payments for Gift Certificates are made via PayPal. We use PayPal because it provides a secure method of making payments. Even if you do not have a PayPal account, you can use it to make secure credit card payments. To purchase a gift certificate from Future Air, simply fill out the form below. If you want the certificate mailed to you or the recipient, the appropriate address will also be required. Future Air will never send you any unwanted email. Do you have any special comments to be put on the certificate? The gift certificate you buy will be valid for 1 year from the date of purchase.